Earlier this year, Dragon Fantasy: Book 1 was released on the PSN, and paid homage to classic RPGs from the NES era of gaming. Book 2 draws its inspiration from the next generation, mostly Chrono Trigger, with some more from Earthbound and even Pokemon. The Chrono Trigger inspiration is easily seen when you look at the game. As opposed to the previous game's first person perspective, the game now shows all of your characters on the map and in battle, and all of the enemies appear as you move around. If you don't like random encounters, you'll appreciate the way this game does it. The battles will take place where you start the fight, which is both good and bad. Good because it just feels more fluid, and you can sometimes maneuver an encounter so the enemies are bunched up. Bad because sometimes the enemies really spread out, occasionally ridiculously so. Also, wandering enemies can and will join the fight. Early on, this makes some battle much more difficult than they have to be. In a nod to Earthbound, if you are significantly stronger than the enemies, starting an encounter will have the main character "SMASH" them, winning the fight instantly. This does get you full Exp, Gold and Items, so it is basically just saving you time and the enemies' embarrassment. Enemies will not respawn until you leave the dungeon, which is helpful when making your way through it (or back to the save point), but less so when you want to grind or missed catching a particular bounty (more on this later). For good measure, there's even two ship battles, where you must grab rock monsters to launch at the enemy ship. They are pretty fun, but it would be nice if there were more than two, or a way to repeat them later in the game. The skills and spells you get will give you some variety in hitting all of your foes. You get some single target ones, a few ones that target a line and a lot that hit a radius (both small and larger). Seeing some of these skills and hit boxes will really remind you that this game was inspired by Chrono Trigger. Skills and spells will, of course, take MP, but after a few levels you won't run out quickly. The effects are much better than the previous game, and all characters and enemies have animation to go along with their movements and attacks now. I'd say that all of these things make the look and fights of the game better, even if enemies adding themselves to the fights gets annoying. Is killing enemies the only option? Not quite. You can also capture them, and they will serve as party members (now you see why I said there was a little Pokemon thrown into the mix). This is almost necessary for the parts of the game where a character will be without the rest of the main party, so make sure to carry a few capture nets for good measure. Monsters you capture will have a different name that usually goes along with their class/type or what they are in reference to (the thief's name is Robert Heif, for example). They also will likely have a unique skill or two, and then learn the same pool as other monsters you capture. Monsters have low MP, but the skills they use are cheap. Adding them to your party is useful to fill its ranks, but they just don't perform as well as the named characters. It is fun to catch them all, though. Last time, the story was told in 3 separate chapters that could be started in any order and all fit into an overall narrative. Dragon Fantasy: Book 2 picks up where the third chapter left off, as our heroes are taking a boat trip. After about 2-3 hours, you will be given a similar choice, all of which tie together. It's a nice way of giving some freedom to the players while still maintaining a strong, overarching story. I think it's pulled off very well, and many times I kept playing because I wanted to see what was going to happen next. While it overall feels slightly more serious than the last game, there is still plenty of humor. There is lots of silly dialogue, enemy names/attacks and tons of references to gaming/RPG culture. You may know from my other reviews that I'm a fan of things like that, so I like that aspect of the game. For me, the story and the parodies/jokes are solid and enjoyable. There are a few diversions from the main story if you are so inclined. Besides catching monsters, there are several side quests called "bounties". Completing these will give you some money and usually an item. Bounties come in three flavors: capturing a certain monster, killing a certain monster and examining a certain location for an item. They aren't very hard or out of the way, so there's no reason not to do them. Completing the story and about half of the bounties took me 13 and a half hours, so it is longer than the first game, which is a plus. Cleaning up the trophies and the remaining bounties took me another 5 hours. Thankfully, I was able to make my way through the story without the need to grind, so the balance of the game is good, too. There are a few downsides to the game as well, as it is lacking some polish. For a week, one of the bounties was unable to be completed. There are ways to make NPCs slide along a line, sometimes even off the map. At first, auto-saving on the PS3 would make movement really lag. The Vita had it slightly better, where the auto-save would have the game sit on a black screen for a few extra seconds, but had no lag while you could move. However, Woodsy's final spell, Metios (maybe my favorite reference in the game, right down to the MP cost), would turn the game into a slideshow on the poor Vita. The silver lining to this is the developers are still working to polish the game, and talking directly to the community for feedback. Problems are fixed fairly quickly, which was a great thing. If you are a trophy hunter, or just disappointed that the previous game didn't have a platinum, you will be happy to know that Dragon Fantasy: Book 2 does feature a platinum for your efforts. You will get a few trophies for story progression, and a few for doing side quests and capturing monsters. Be aware that capturing 50 different monsters can be almost impossible later in the game if you haven't been grabbing them when you can during the story (because of the SMASH described above). There's also a trophy in the beginning that's easy to miss, where you have to fight a Rock Man (who's Mega powerful) so it can be captured a little later. The only grinding trophy is to get a single character to lvl 99 (no, using a captured Nugget doesn't count). Fighting solo will get this much faster, and you can use that character to finish the final boss solo and claim that gold trophy for your collection, too. Not too bad a list, as they are all obtainable. Fans of 16-bit era RPGs should check out Dragon Fantasy: Book 2. While you will get more out of it if you have played Book 1, it's definitely not necessary to have played that to enjoy this game. It is a lighthearted take on RPGs that we know and loved, with a decent story to boot. While at launch the game was lacking some polish, this will be less of a problem as time goes on. The music is pretty catchy and the graphics and animations are pretty good. Save for a few instances, the game played well on both PS3 and Vita, and you can use the internet to transfer your save file from one to the other. There's even some multiplayer coming to the game soon, which I will update the review with when I get a chance to check it out. Dragon Fantasy: Book 2 is fun and I look forward to Book 3. The final part, #4, will focus on the indie titles that I saw and played at the Indie Mega Booth (or something along those lines). I enjoyed Book 1 of Dragon Fantasy, so it stands to reason that I would be looking forward to Book 2. The style is more like Chrono Trigger (the first game was like Dragon Warrior) and the enemies were on the field as you fought (no random encounters). I mostly watched a bit and talked the lead creator about the game. Adam Rippon was pretty cool throughout my encounter with him. A real down to earth guy, he was also pretty candid about the game and other things. He also seemed interested in bringing a version of Dragon Fantasy to other systems, which would be cool to see. 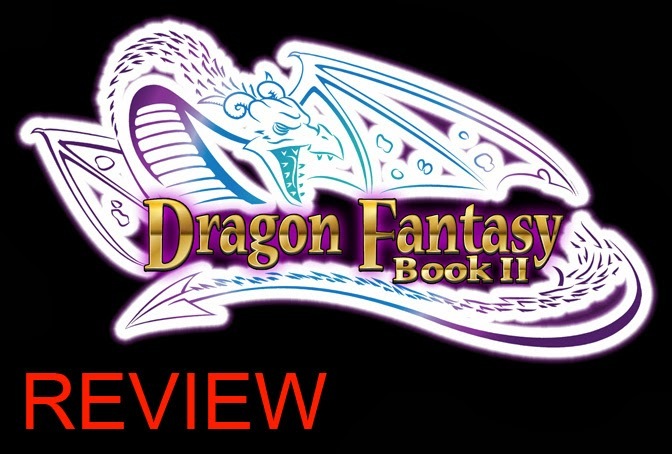 Since the show was about a week and a half before the game came out, I was able to get a review copy, so a review of Dragon Fantasy: Book 2 will be here soon if you are interested in hearing more about the game. I had not heard of this game until I wandered across the booth at PAX, and it looked like a side scrolling beat-em-up in the vein of Castle Crashers. Since I like those kinds of games, I figured I would give the game a spin. I'm glad I did. 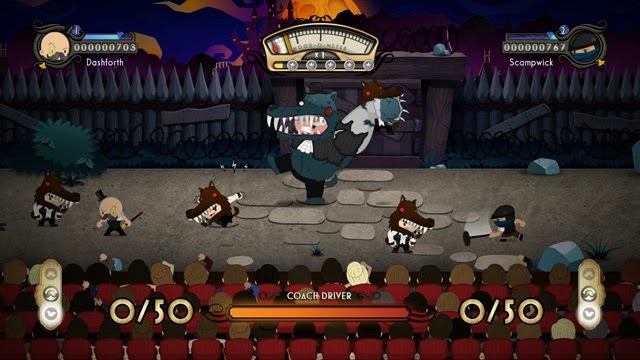 The game is set up as a character performing a play about his life as a demon hunter. High hitting combos and evading enemy blows would win them over and get you more points. The presentation was really nice and I liked the concept. The game also played pretty well, and was definitely build for co-op since the main character has a side kick helping him perform the play. The enemies were also actors, and wouldn't die so much as lay down and crawl away when the lights were off of them. My partner (another random dude) and I performed well enough that after the boss of the stage, we got an "encore" where enemies from the stage would rush us and we could fight them off again for more points. It was really fun and I look forward to trying the full version. As it stands, I did receive a review copy so in the near future I can tell you all how the full game panned out. The game has been described as taking the best of 80's anime and cramming it into a space flight/ shooter game like the original Asteroids. After seeing it in action, that is a very good way to describe it. The main character was named A-Tak (har har) and his look and spacecraft did remind me (and just about everyone else) of Macross/ Robotech. The game isn't a standard shoot-em-up (shmup), either. You can slyly go around unsuspecting foes and catch them off guard. This is important because the bigger enemies can kill you quickly. The ship controls in a floaty manner reminiscent of Asteroids (as mentioned before), so you have to be careful not to run into your surroundings. Probably the best part are the missiles. You can target several enemies in your cone, and fire a barrage of missiles (complete with missile trails) to destroy them. Yup, Macross. The game is slated to come out next year, but looked surprisingly far along. The developer talked with me a bit about the game as said they started with making the core concepts solid and plan to build all of the other stuff on top of that. Given what I saw of the game, they have a solid core intact, so we will see what all gets piled on the top. The game looks fun, but hard, and I look forward to trying it next year! So as you may have already read, I was able to go to PAX Prime for one day, the last day, which I dubbed "Mighty Monday" for no reason other than to be sarcastic about getting to go on the last day, which usually is not the best to go. I was able to play a few games, despite the stupid long lines and the massive crowds. First up are the two Xbox One games I looked at. The game looked really good (graphically). The shadows and details were crisp and looked natural. There is a noticeable difference between the next gen and the current gen (although not as big a difference as the previous to the current gen). You attack with the X Button and block break with the Y Button. The A Button is for parrying. The controls were responsive, especially the parry, since it would interrupt my attacks to do it. That's very helpful and kept the combat fun and fluid. It reminded me of the early fights in the Batman: Arkham games, where you were supposed to be aggressive and counter when the enemies attacked. There was also a "rapture" mechanic where you filled a meter to become really powerful for some time. Yeah, nothing new or ground-breaker there, and would have been better if you could activate it yourself rather than just when it finishes filling up. The demo paired people off for some co-op fights. Executing an enemy would restore some health to both players, and you could revive a fallen friend quickly (which is very helpful with a group of guys breathing down your neck). For my demo, a partner and I were in an arena for a few fights. At first we had to kill a few guys, then a champion appeared, and he had flaming swords. I ran up to take him on. After a few block breaks and a combo, he had the skull above his head that signified he could be executed. I tried that, and it didn't work, then I tried to attack him so he would fall into the spike pit... which also didn't work. Then spears shot up around us and I was trapped in a tiny space with him. Uh oh. We traded blows for a bit while I was hitting the spears to break my way out. I eventually did (those spears are surprisingly sturdy), but not before I lost a good chunk of health. The champion was slain and my partner had taken out the rest of the enemies to finish the wave. The next two waves of opponents were not as... eventful, but they were fun. There were more of the dual flaming sword guys and even some shield guys. Since I wasn't trapped in a closet with them, I was able to dispatch them without much trouble. Plus, I had finally figured out that it takes multiple block breaks to get through the guards of the stronger opponents. I like the execution mechanic, but it didn't seem to always work on the stronger guys. There were some multi-part executions, and I had to just guess what would work, since there were no on-screen prompts. I could deal with that but nowhere did they explain what buttons to hit. I don't think Ryse: Son of Rome a system seller, but I enjoyed the game and would play it with a friend (especially if there is local co-op, but I don't know if there is yet). Wow, again the graphics looked very good in KI. I've watched several videos, but they really don't do it justice. Admittedly I didn't try it, since it's a fighting game and the people I watched had a decent grasp on what to do, so I would just get demolished. I do think I watched too many videos of it on Youtube, since whenever someone would do an Ultra Combo, I could hear the music, despite the fact the game audio was through the headphones. Yikes. Also, thinking back on it, I don't think the Microsoft booth showed off any 360 games, just Xbox One games. I could have missed them, though, it would fit in with how MS handled the transition from Xbox to Xbox 360 (they just dropped the Xbox almost immediately). Sony seemed to have a better mix of current and upcoming gen games to play. Sorry I've been inactive the last week or so. My son brought home a cold and we all shared it, so I haven't finished my PAX write-ups yet. Don't worry, they will be coming soon. There's also two new games I am working on for review, so more of those are coming too. I'm also helping to edit my wife's next book, which is taking a long time because we are both so busy. I suggested a fairly big revision, so she changed some things and called it the "review copy". I jokingly told her she called it that so I would put lots of effort into it, since I usually do my review stuff before working on her next book. Oh, checking my inbox, it seems there is now a third. I am to be kept busy while recovering it seems.